It’s the last shopping weekend before Christmas and if you’re anything like me that means you’re currently in a state of mild full-blown panic about all the presents you still need to get. Before I go out and brave the crowds, here are six books that would make great gifts. And if you’re not giving them away, give them to yourself. As a treat for all the December crazy. I’m not recommending this book because I’m in it. I’m also not recommending it because I’m in it roaringly drunk. Although I feel that those would be good reasons to praise a book. I’m recommending it because Elisabeth Raether has written a deep book about a light subject. Or even a light book about a deep subject: the art of drinking. And she does make it an art. Elisabeth’s column „Die trinkende Frau“ appeared in ZEITMagazin between 2011 and 2016 and every time a new episode was published I begged her to please, please, please write them more often. I didn’t want to turn her into an alcoholic. It’s just that she writes so well (not just about drinking) that it’s much too much fun (just like drinking) to read her. Thankfully, her collected columns, plus a few new ones, are now available as a book. I can’t think of anyone who can spin aperitives, physiotherapy, our obsession with wellness and mean Berlin bus drivers into a two and half page narrative that goes down as easily as a glass of bubbly and has a sober profundity all the same. Drink it in! A tip from Okka that I can’t help but pass on. Because firstly: Mary-Louise Parker has written a book? Great! Secondly: Mary-Louise Parker has written a great book. Even better! I was, as always, surprised when the book arrived to see all the praise on the cover, but nothing to tell you what the damned thing is actually about. Dear Mr. You is lauded as „Funny, heartbreaking and profound“ and „So seriously good seems like overkill. But it is.“ and as „Full of poetry, with lines as startling as breaking glass.“ Which is all true. But who needs all of that when the idea is so convincing already: Parker tells the story of her life in the form of letters to the men that shaped her. Her grandfather and father, a teacher and quite a few lovers, the doctor who saved her and the man who will one day love her daughter. Her stories are unguarded and vulnerable in a way that famous actresses normally don’t allow themselves to be in public. The only thing she holds back are the names of her lovers. But I forgot that she is a famous actress a few pages in anyway and instead got immersed in the tales of a daring woman who writes as she lives her life: with beautiful abandon. I try to imagine it: A girl is nine years old when her mother first can’t get out of bed and eventually can’t even leave her own house because she is crippled by fear. This was the 90s and there wasn’t the understanding and acceptance of anxiety disorders that there is today and so the girl has to find her own way of dealing with her mom’s sickness and its implications. I imagine that she could’ve taken many paths in doing so. Miriam Stein didn’t duck away, she faced fear head-on. In the book, she both dares herself in some very personal challenges – she has her genome sequenced as an adult to find out more about her identity as an adoptive child –, and the reader to come to terms with modern fears that envelope so many. Fear for one’s existence, fear of failure, fear for your children. I image that it took some guts to write all of this down. Not that the author would ever pat herself on the back. She’s not the type. Her writing is wise and reflected, full of empathy and never sentimental, and it manages something quite miraculous: this moving book about fear gives you courage. Zadie Smith’s White Teeth is one of those books that I read in one breath and that completely blew me away. The language. The humour. The precision. The sheer boldness of turning out this immersive tale of three families as a first novel as though there was nothing to it. I’ve bought every one of her books since. Some I liked better than others. Swing Time might just make me breathless again, even though I’m only 20 pages in and at my current reading speed will probably take a good while to finish it. I don’t mind, because I love spending time with Smith’s two London girls who dream of being dancers. Once again it’s a story about it all, about identity, race, destiny, friendship, written by someone who was meant to write. What a privilege it is to read Zadie Smith. Back in the day, when colleagues would travel to the US, I’d practically beg them to bring back an issue of Domino. Then the financial crisis of 2008 hit, I didn’t have an office with colleagues anymore and Domino folded as well. Magazines, it seemed to be decided, were a thing of the past. Out of personal reasons alone – I still work for magazines, I still love magazines – I was so happy when Domino was revived in 2013. It’s now published as a quarterly, with daily updates on the website. I was even more delighted when Your Guide to a Stylish Home recently arrived in our home. What I love about it, as I do about the magazine, is that it takes design as unapologetically serious as you must if you want to fill 270 pages about the arrangement of vases and the anatomy of cheese plates. No kidding, there’s a subchapter titled „anatomy of a cheese plate“. It’s just as delicious as „understanding upholstery” and „the art of the layered bed“. If you’ve ever nerded out over throw pillows, hanging pictures and bathroom tiles, this book is for you. And while it’s deliciously nerdy, it’s also irrevocably competent. There’s a tip in every picture caption as well as fabulous, but accessible home stories, expert interviews, how to get the looks and an extensive list of shopping resources. I think it’s best read with a fresh stack of post-its, as you’ll want to mark something every few pages (even if you’ll never arrange a cheese plate in your life). One day, when we have a fully functioning kitchen again, the first thing I’m going to do is cook from Meike Peters’ book. It’s been lying on the kitchen island, daring me to unpack our pots and pans for months now. Maybe the crispy fried potatoes with fennel. Or the Maltese lemon and ricotta pasta. The Riesling and elderflower chicken with apricots. Or crayfish with beet mousse on sourdough. No, definitely the lemon cardamom crescent milk rolls. The book was born out of the eponymous blog that Meike started simply because she loves cooking. And her cooking is so straightfoward and unfussy that you’ll love her food with equal measure. The recipes, which are mostly inspried by the German and Mediterranean kitchen, don’t require hard to find ingredients or expensive utensils. The most important thing it asks of you is to rediscover the joy of standing in your kitchen, putting on some music, opening a bottle of wine and start cutting, stiring, serving. What a treat indeed. 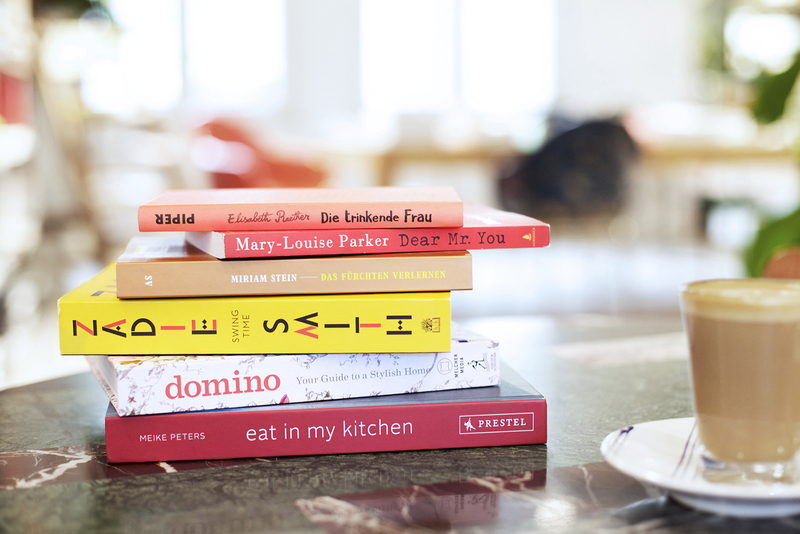 This entry was posted in design, fashion, food and tagged books, Das Fürchten verlernen, Dear Mr. You, Die trinkende Frau, Domino – Your Guide to a Stylish Home, Eat in my kitchen, Elisabeth Raether, Mary-Louise Parker, Meike Peters, Miriam Stein, Swing Time, Zadie Smith. Bookmark the permalink. Post a comment or leave a trackback Trackback URL. Thank you Marlene <3 Let me know when your kitchen is up and running, I'd love to cook together with you for my meet in your kitchen series. Lots of love for the new year!